Plentiful sunshine. High around 60F. Winds NNE at 15 to 25 mph. Higher wind gusts possible..
Low served in Iraq from August 2005 to November 2006. Here, he stands on a hill overlooking the ruins of Nimrod, near Mosul. Rich Low served in Iraq from August 2005 through November 2006, leading some 280 combat missions. He participated in a pilot study at UW-Madison that looked at the effects of breathing and meditation on veterans returning from war. Rich Low of Madison practices alternate-nostril breathing as part of an experimental intervention for returning veterans involving yoga breathing and meditation at the Center for Investigating Healthy Minds at UW-Madison’s Waisman Center. 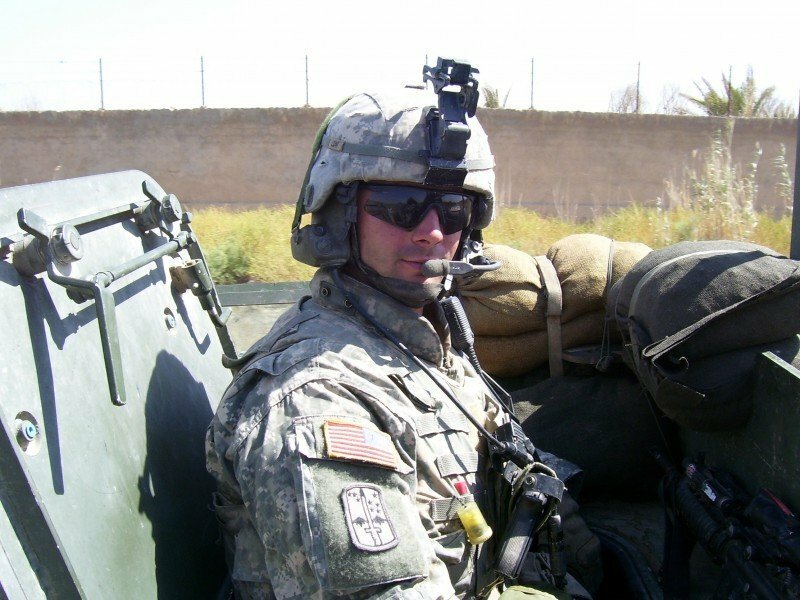 Rich Low of Madison served as an infantry officer in the Army in Iraq in 2005 and 2006, leading some 280 combat missions. When he came back from the service, he didn't think his experience affected him in any major way. He had nightmares, and he startled easily, but he chalked that up to just something veterans live with. Then he enrolled in a study he initially wrote off as "just some hippie thing," where he learned about yoga breathing and meditation. A year later, Low, 30, sums up his experience with two words: "It works." That's the idea behind the study coming from The Center for Investigating Healthy Minds, at the Waisman Center on the UW-Madison campus. Researchers there, including associate scientist Emma Seppala, believe something as simple as breathing can change the lives of veterans returning from Iraq and Afghanistan, even those who don't think they have post-traumatic stress disorder. "Military people don't want to be seen as victims, they're so brave," Seppala said. "They're not always open to therapy because they hate the victim status, so we want to give them practices to empower them with tools they can use to help themselves." To that end, the scientists at the CIHM plan to take what they learned in the pilot study and back it up with neuroscience, with a larger study planned for early next year. "There will be the inclusion of a very significant neuroscience component in this new phase," said Richard Davidson, founder and chair of the CIHM. "We'll use state-of-the-art brain imaging methods to examine changes in brain functions and structure that are induced by these interventions." Last year's pilot study involved a weeklong regimen in which veterans learned a yoga breathing technique called Sudarshan Kriya yoga, which involves cyclical breathing patterns, along with mindfulness meditation. Seppala said the treatment holds promise for PTSD symptoms, which include intrusive thoughts, emotional numbness and hypervigilance. Emotional numbness is something Travis Leanna, a 25-year-old veteran and UW-Madison student, identified with after returning from Iraq, where he served with the Marines for six months. "The study was an eye-opener," he said, after admitting he signed up for it because of the stipend involved. "I didn't have PTSD, but I felt disconnected." After a close family member committed suicide in 2009, Leanna said, "I was almost unaffected, I didn't feel it. I looked at life objectively, like I was just going through the motions." He signed up for the meditation study with low expectations. "I thought what they were proposing was pretty goofy. I thought, ‘They're going to tell me to clear my mind — what does that even mean?'" In the end, it meant something that came as a shock. "It brought back my feelings. The experience opened me up," Leanna said, so much so that he continues to use the breathing techniques often. "They help me focus and de-stress," he said. "That experience changed my life, and I don't even have PTSD." Science seems to be just catching up with ideas espoused by ancient practices such as yoga and meditation. "The goal of these kinds of practices is to change one's relationship to the trauma, change one's relationship to the negative emotions and intrusive thoughts that may arise as a consequence of the trauma," Davidson said. "By changing one's relationships to these disturbing emotions and thoughts, the goal is that eventually those emotions and thoughts will decrease in their intensity," he said, allowing veterans to move past their trauma. This sort of treatment could also help those who struggle with mood disorders, such as anxiety and depression, that aren't associated with military service. "There is a little bit of evidence in the scientific literature that speaks to the efficacy of these interventions for a broader range of disorders, although it's also important to underscore that the work in these areas is at a very embryonic stage," Davidson said. "Our work is really part of a new chapter in research on the applications of these methods with specific clinical groups using rigorous controlled designs." The scope of this study will be determined by private funding, as parts of the research require many resources, such as the brain imaging component, Davidson said. The scientists are seeking veterans to participate in this next larger study, which will examine the differences between the yogic breathing technique versus meditation. One of the main goals of the new study is to determine who will benefit most from which treatment. As Davidson said, "One size may not fit all." Indeed, veteran Low underscored the differences in coping styles among veterans. "In the military, the way of dealing with an intense situation — like if someone in your platoon is killed — is to sit with chaplain for a ‘cry session' for maybe an hour, and then you just have to move on," he said. The tools he learned at the CIHM take about the same time, and they work for him, but "each person is unique," he said. "You have to have several ways to deal with things." The research study is the subject of a documentary film called "Free the Mind," which will be released in 2012. Phie Ambo, the documentarian, contacted Davidson with the idea of a film on the work being done at the CIHM. "She filmed me in very remote places of the planet," he said, but the focus of the film is on the veterans. Seppala, the head scientist on the study, said she was thrilled to have the documentarians chronicle the experiment and capture the emotions involved. "It's so wonderful to have this film, so that the experience is more than just a paper in a journal," she said. Low is featured in the film, and he expressed hope his participation will help other veterans who may be reticent to admit they need help. "Appearance means a lot in the military. Our uniforms have to be perfectly ironed and starched. We're not used to dropping our guard," he said. "I had to let my guard down big time, but that's incredibly valuable if it helps people." Low's altruistic philosophy comes from a very personal place. After coming back from Iraq, he said he started to feel a lot of intense guilt and frustration, "guilt at things that I had been a part of." He withdrew emotionally, and his loved ones took notice. "I think the breathing released a lot of stuff I had kept bottled up," he said. "This study took me back through my events in Iraq, and my body finally started dealing with the things in my mind." Earlier this year, after the study, Low went hunting with his dad. His easy demeanor impressed his father, who remarked, "You're you again. The you from five years ago." Veterans interested in participating in the next study can find more information at the Center for Investigating Healthy Minds website at www.investigatinghealthyminds.org, or by emailing the Veteran Wellness Study at wellness@mailplus.wisc.edu.